Overview - Badlands announced the arrival of a major talent: Terrence Malick. 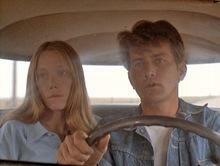 His impressionistic take on the notorious Charles Starkweather and Caril Ann Fugate killing spree of the late 1950s uses a serial-killer narrative as a springboard for an oblique teenage romance, lovingly and idiosyncratically enacted by Martin Sheen and Sissy Spacek. The film also introduced many of the elements that would earn Malick his passionate following: the enigmatic approach to narrative and character, the unusual use of voice-over, the juxtaposition of human violence with natural beauty, the poetic investigation of American dreams and nightmares. This debut has spawned countless imitations, but none have equaled its strange sublimity. The film opens in Fort Dupree, South Dakota in the 1950s, Holly (Spacek), the narrator of the story, reveals her mother passed away and her father (Warren Oates) moved them from Texas. She's 15, but obviously older when she relates what happened. One fateful afternoon, while twirling her baton in the front yard, she meets Kit (Sheen), unaware then, as her voiceover reveals, "that what began in the alleys and back ways of this quiet town would end in the Badlands of Montana." Kit is 25 years old, with no direction in his life, as his inability to keep a job as simple as a garbage man shows, but when he sees Holly, he's knows he wants her. She is flattered because Kit "could've had any other girl in town if he'd given it half a try." Her father has a different opinion. Angered when he finds out she had been sneaking around with Kit, he kills her dog, the first of many deaths to follow. Kit tries to assure her father how much Holly means to him, but her father will have none of it and tells Kit to stay away. Kit sneaks into Holly's house to take her away, and when he lets her father know he's got a gun, the viewer can tell "nobody's coming out of this thing happy," as Kit later states. Holly takes her father's death better than expected, seeming to accept Kit's actions, but then she had dealt with death before, her mother, a couple pets. Kit then tries to fake their deaths in a spectacular blaze that looks exquisite. The two then hide in the forest, like they were living in the middle of a children's adventure story. For shelter, they build an elaborate treehouse. For food, they fish and "steal a chicken or a bunch of corn or some melons." They created traps and devised new passwords every day, but they didn't stay hidden for long. As the bodies pile up in their wake, they become a national sensation and "the whole country [begins] looking for" them. Each day it grows a little harder to stay free, and each day Holly seems less interested in continuing. With its youthful criminal protagonists, 'Badlands' brings to mind 'Bonnie and Clyde,' although the imagery of violence doesn’t take the center stage as it does in Arthur Penn's landmark film. Instead, it's the indifference to the violence by the main characters. Shot in the early '70s and containing an image of Sheen with his arms resting on a rifle that lies across his shoulders, it bring to mind a soldier or a man being crucified, I can't help thinking about the United States and the fatigue of the Vietnam War. Malick demonstrated a great talent as a writer/director right from the start. The story is a unique approach to these characters and wraps up in a satisfying way. The characters speak in a wonderful and consistent manner. They reveal themselves through what they say rather than pushing the plot along. The lead actors are outstanding and really nailed their parts. Though Malick went through three cinematographers, he reveals a great eye, as a number of shots take advantage of the natural beauty of the landscapes. All told, an impressive debut. 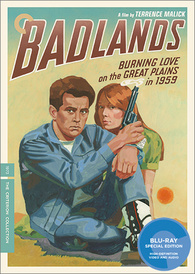 'Badlands (#651 in The Criterion Collection) is a 50GB Region A Blu-ray disc in a clear keepcase. The discs boot up directly to the menu screen without any promotional advertisements. Included is a 20-page booklet containing "Misfits," an essay by American filmmaker Michael Almereyda. The video has been given a 1080p/AVC-MPEG-4 encoded transfer displayed at 1.85:1. 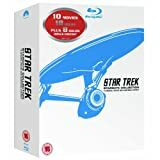 The liner notes state, "Approved by director Terrence Malick, this new digital transfer was created in 4K resolution on a Northlight film scanner from the original 35mm camera negative. Thousands of instances of dirt, debris, scratches, splices, warps, and jitter were manually removed using MTI's DRS and Pixel Farm's PFClean, while Image Systems' Phoenix was used for small dirt, grain, noise reduction, and flicker." The source looks clean, free from wear or defect, except for the like black and white newsreel footage, which has dirt and scratches to make it appear authentic. There is a bit of light grain. The colors come through in rich hues, first noticeable in the green foliage of the suburban neighborhood, and seen throughout in the bright, blue sky; the deep blue denim of Kit's clothes; and the yellow and orange seen in the fire that burns Holly's home. Both white and blacks are solid. Contrast is impressive and shadow delineation is satisfying. Textures are evident on the buildings and the aged signs Holly's father paints. A series of close-ups of objects in the forest deliver sharp details. There are some minor things to quibble about. Edges can be a tad soft at times and faces grow smooth, like when Kit greets a man (Malik's cameo), who leaves a note for Mr. Scarborough. There was a brief light flicker during the scene when Kit and Holly's father are in the upstairs hallway. The audio is available in English LPCM 1.0 and "the original monaural soundtrack was remastered at 24-bit from the original 35 mm magnetic tracks. Clicks, thumps, hiss, and hum were manually removed using Pro Tools HD. Crackle was attenuated using AudioCube's integrated workstation." The dialogue sounded clear throughout and the ADR wasn't distracting. The score, whether a lone xylophone of a children's chorus, was well balanced with the other elements. The quiet end of the dynamic range offered the crackling of fire and the soft chirping of crickets in the night. I don't remember the last time I heard the passing of cars and trains sound so good on a mono track. The gunfire was a little lacking in oomph. Making Badlands (HD, 41 min) – Created for this new release, the documentary features Sheen, Spacek, and her husband/the film's production designer Jack Fisk in separate interviews as they discuss getting the job and working on the project with Malick. It's obvious the film has a special place in all their hearts and not just because the Spacek and Fisk met while making it. Producer Edward Pressman (HD, 13 min) – Talks about working on the film and what it took to compete it as older crew members bristled at Malick's directing style. Editor Billy Weber (HD, 22 min) – Another newly created extra finds the editor, who also worked on 'Days of Heaven' and 'The Thin Red Line', discussed his collaboration with Malick and the film's story. Trailer (HD, 3 min) – The original trailer is included. Fans of the New Hollywood era should enjoy 'Badlands', as right from the start, Malick revealed himself to be a filmmaker with a vision, and thanks to Criterion, the film has never looked better. Not surprisingly, Malick isn't on hand in the extras, but those who worked with him on the film provide some insight into the man and his process. This is highly recommended.